Jamestown Regional Medical Center is a 25-bed, critical access facility with 24-hour emergency care, located in the south central region of North Dakota. The hospital serves of 55,000 peoppe in a 9-county area. 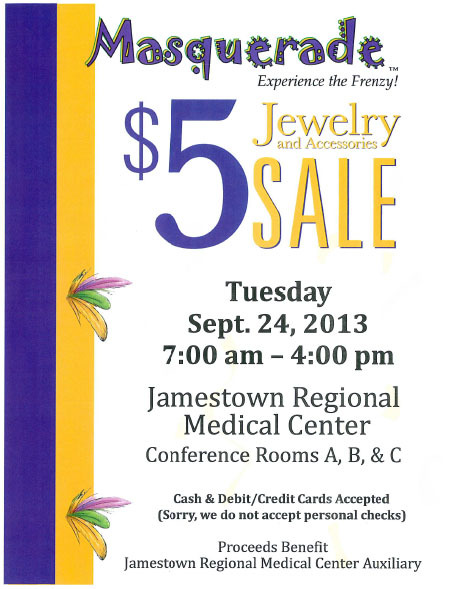 Join the JRMC Auxiliary as they host a jewelry sale on Tuesday, September 24th at Jamestown Regional Medical Center. The sale will run from 7 am – 4 pm in the lower level conference room. All jewelry and accessories will be $5. Cash and debit/credit cards are accepted. The proceeds will benefit the JRMC Auxiliary. 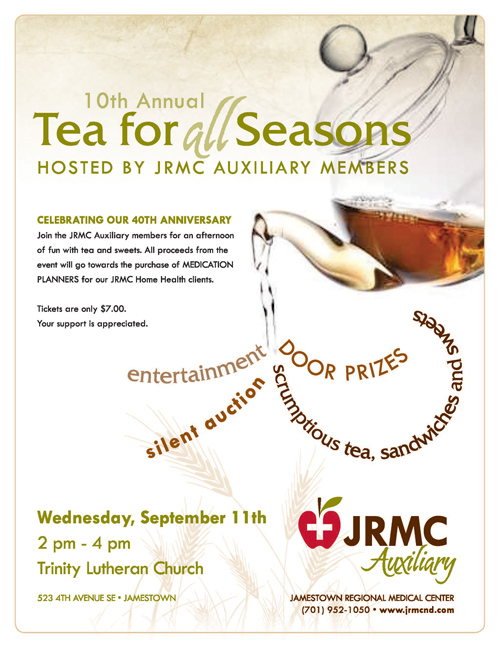 Jamestown Regional Medical Center (JRMC) Auxiliary will host the 10th annual Tea for All Seasons at Trinity Lutheran Church on Wednesday, September 11, from 2 to 4 pm. Tea, sandwiches and sweets will be served, along with a silent auction and door prizes. Tickets are $7.00 per person and can be purchased from any JRMC Auxiliary member or at the JRMC Gift Shoppe. “Proceeds from this year’s event will go toward purchasing medication planners for JRMC Home Health clients,” stated Nancy Jo Johnston, volunteer coordinator at JRMC. For more information call JRMC volunteer services/Auxiliary at 701-952-4809. Thank you to all the men and women of the JRMC Environmental Services department who play an essential part in the execution of infection control cleaning procedures, patient safety goals and customer satisfaction. They are important to ensuring that JRMC is the best rural hospital in the country for patients to receive care, employees to work and physicians to practice. There’s been a “baby boom” in Jamestown. 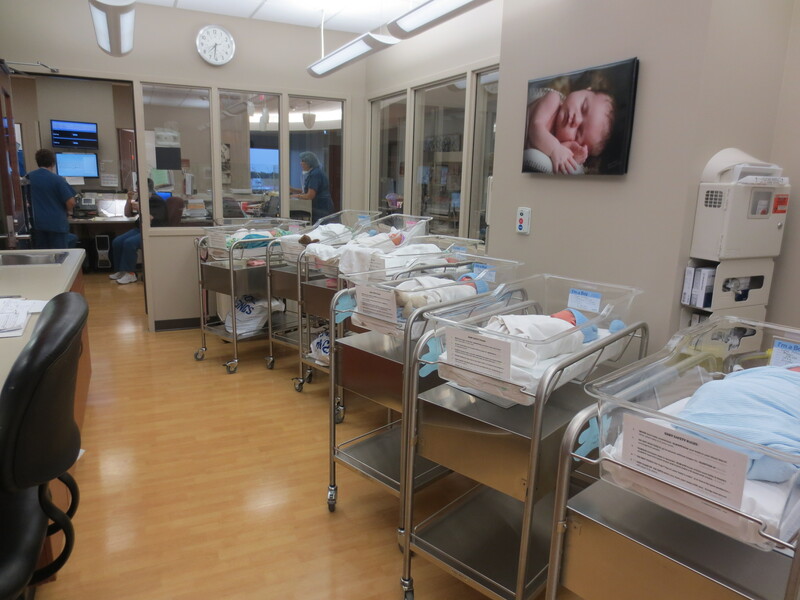 Eight babies were born between Tuesday and Thursday at the Jamestown Regional Medical Center Family BirthPlace, said Emily Woodley, BirthPlace nursing manager. After the eighth birth, all eight of the newborns were in the nursery at the same time for a few hours Thursday morning, but two were discharged later in the day, Woodley said. The last time she remembers the Family BirthPlace caring for this many babies at once was two years ago, also around Labor Day weekend. “It’s so funny that it was the same time of year,” Woodley said. Staff members dubbed it “the baby boom,” Woodley said. There were five boys and three girls born. A lot of teamwork went into caring for the eight babies and their mothers. Depending on staff members’ specialties, some would work with only mothers, others would work with only babies and others worked with both. “It’s a lot of fun,” Woodley said. Jamestown Regional Medical Center recently sponsored a blood drive for the United Blood Services on Aug. 13 at the JRMC Clinic. Out of 54 volunteers that signed up to donate blood, 41 were able to give. Eight donors gave blood on the automated 2RBC machine, which collects two units of red blood cells during the donation. Twelve volunteers donated blood for the first time. JRMC’s blood drive total contribution was 49 units of blood for United Blood Services. Happy Feet! Meet Essentia’s new podiatrist, Dr. Jill Kang and learn about caring for your feet…after all, they need to last a lifetime. Please RSVP to (701) 952 – 4796 as space is limited.